Rimavská Sobota - an important town in the region with the population of 25 309, it covers the total area of 7 751 ha. It is situated in Slovenské Rudohorie area and surrounded by the protected area Cerová Vrchovina and national part Muránska Planina as well as river Rimava. The first writen reference comes from 1270 and the original name of this town was „Rymua Zumbota". It became the town with its rights and rules in May 5th 1334. 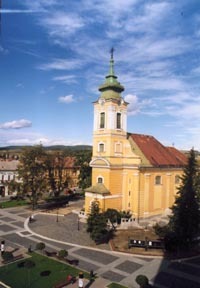 Roman – catholic church or St. Jána Krstiteľa was built on the basis of an old gothic building. Visitors of this church can admire the painting of Vincenzo Fischer called „Sťatie sv. Jána Krstiteľa" („The Happiness of St. Jan Krstiteľ"). It is placed in the middle part of the church. Gemersko-Malohontské Museum (there are some rare archaeological excavations, for example the mummy of Egyptian woman from the town called Abusír-el-Melek from 945-525 BC). There are quite a few folk, singing and theatre assemblies, singing quartet group etc. Sport: There are a few sport facilities such as swimming pool, tennis courts, ice-ring, football stadium, cycling paths, foothpaths etc. Holiday resort: Many visitors have already enjoyed their stay in Kurinec – recreational area offering swimming potential, hotel accomodation, camping site, water bicycles and boats, minigolf and bowling. Traditional food which is typical for this area is served in the local restaurants. You are always welcome in Rimanska Sobota.